Introduction by Congressman Jesse L. Jackson Jr.
From a mother, role model, and civil rights veteran, an inspiring gift of love to a child in his darkest hour. Jacqueline Jackson promised her son, Congressman Jesse L. Jackson, Jr., that she would write him every day during his incarceration in federal prison to serve his thirty-month sentence. This book is an inspiring and moving selection of the letters she wrote him. Together, they comprise a powerful act of love―nurturing and ministering to her son's heart, health, and mind and maintaining his essential connection with home. Frank, anecdotal, imbued with faith, and sometimes humorous, they offer intimate details from the family’s daily life, along with news of friends and the community and glimpses of such figures as Nelson Mandela, Winnie Mandela, and Mayor Marion Barry. They also touch eloquently on issues of social justice, politics, and history, as when Mrs. Jackson recalls growing up in Jim Crow Florida, and they reflect the qualities, instilled by her own mother, that made her a role model for much of her life. Ultimately, these letters offer a blueprint for why we have to support our families not just as they elevate but when they fall. 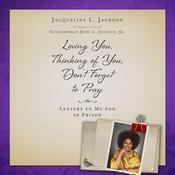 This collection is Mrs. Jackson's contribution to healing during a time when our prisons are full and our communities are suffering. She provides the road map for ensuring that the individuals serving sentences understand that prison is where they are, not who they are and for helping them sustain the courage to keep hope alive. 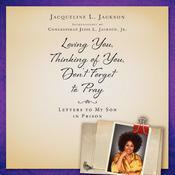 Jacqueline Jackson promised her son, Congressman Jesse L. Jackson, Jr., that she would write him every day during his incarceration in federal prison to serve his thirty-month sentence. This book is an inspiring and moving selection of the letters she wrote him. Together, they comprise a powerful act of love―nurturing and ministering to her son's heart, health, and mind and maintaining his essential connection with home. Frank, anecdotal, imbued with faith, and sometimes humorous, they offer intimate details from the family’s daily life, along with news of friends and the community and glimpses of such figures as Nelson Mandela, Winnie Mandela, and Mayor Marion Barry. They also touch eloquently on issues of social justice, politics, and history, as when Mrs. Jackson recalls growing up in Jim Crow Florida, and they reflect the qualities, instilled by her own mother, that made her a role model for much of her life.